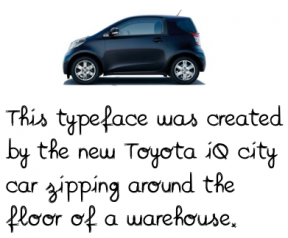 [tweetmeme] Toyota have launched their tiny low-emission iQ car with an innovative marketing campaign: a typeface. The iQ has carbon dioxide emissions of 99g/km and is a competitor to the Smart car. Designers Pierre and Damien, in collaboration with race car driver Stef Van Campenhoudt, created a special kind of font through skilled driving and special tracking cameras in a big, flat, warehouse. A camera tracked four points on the corners of the Toyota iQ. A camera above, mounted to a crane, took those points and delivered them to software that created the shapes, punctuation and all-important letters and numbers that make up a font. So you end up with quite a nice piece of collateral (a font) that can be used to express thoughts in the form of car reviews, about the car. But we haven’t seen any yet. To keep to the ‘efficient engine’ theme, wouldn’t it be better to do a super thin or hashed font that uses less ink when printed? It seems to me the idea’s lacking that final push. And unfortunately, Saatchi & Saatchi (an agency I used to work at), have made the most baffling print ads. At least you’d use the font, surely? It seems like a wasted opportunity. It would have been perfect to have made a slim face – you’d have everyone using a font that was efficient in its use of ink made by an vehicle that is efficient in its use of fuel. Beautiful. I’d vote for that on an awards panel. This iQ campaign reminds me of the story of Michelin tyres that I read from a piece by Brian Millar. 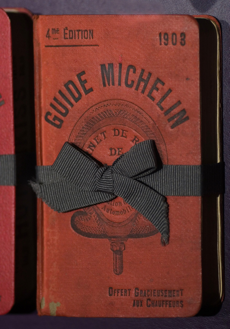 In the early days of motoring Michelin weren’t selling enough tyres so they invented Michelin Guides – the image here is the 4th edition from 1903 – which contained everything you needed to plan a motoring holiday, from maps to restaurant reviews. hundreds of miles to the Côte d’Azur, Switzerland and Italy in noisy,uncomfortable cars. Thousands did, and millions do it today. Wearing their tyres out as they go. Michelin made a piece of collateral that is around well over 100 years later – or, perhaps, better measured as millions of worn out tyres. Toyota could’ve delivered a similar piece of collateral in the form of a super-efficient lightweight font for the next 100 years – or, perhaps, better measured in the millions of ink cartridges not used. It’s a shame they didn’t.